Billed as the most photographed event in the world, the 43rd annual Albuquerque Balloon Fiesta is slated to run from October 4–12, 2014. During that time the morning skies will be dotted with colorful balloons, while the evenings will bring balloon glows and fireworks. To describe it all as spectacular is a gross understatement. And although sometimes large events like this are sorely lacking in access, gladly that’s not the case with the Albuquerque Balloon Fiesta; in fact, the organizers went above and beyond to make sure that wheelchair-users and slow walkers can enjoy this grand event. That said, it pays to plan ahead, so here’s what you need to know to have an accessible and enjoyable Fiesta. On most days the Fiesta is divided into a morning session and an evening session, with a break in the action mid-day. The morning sessions usually start around 6:00 am, while the evening ones begin twelve hours later. It should also be noted that some mid-week days lack an evening session. Admission is $8 per session, and parking is available for $10. Tickets are available at the gate or at www.balloonfiesta.com. Accessible parking is available in the north lot near the entrance. It’s best to display your placard while driving in, so the attendants can direct you to the proper parking lot. The accessible parking area is asphalt, with van accessible spaces available. It’s a level walk to the nearby entrance gate, but there is a golf cart shuttle available for slow walkers. 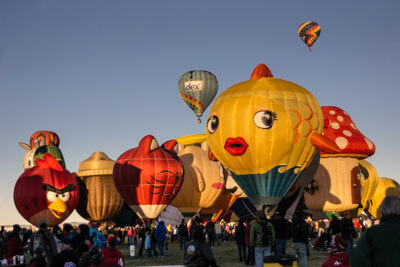 The Albuquerque Balloon Fiesta is unique in that visitors can walk across the grounds while balloons are inflating, and get up-close-and-personal with the balloon crews. The grassy area which serves as the launch field is level and easy to walk or roll over, and there is an asphalt pathway along the border. Additionally, wheelchairs and scooters are available for rent at the information booths; however get there early, as supplies are limited. There is also level access along Main Street, which features a good selection of food and merchandise vendors. Food choices include everything from New Mexican cuisine to fair food, while merchandise vendors offer t-shirts, pins, calendars and other souvenirs. ATMs are located along Main Street, and there are plenty of accessible porta potties throughout the park. Each day brings a different schedule to the Albuquerque Balloon Fiesta, but no matter when you visit, there are a few must-sees. These key events are not scheduled every day, so make sure and plan accordingly, so you don’t miss them. Make plans to see at least one mass ascension. They usually begin around 6:30 a.m., but get there early as traffic is very heavy, especially on the weekends. During this time hundreds of colorful balloons take to sky in two waves. It’s really a site to behold and a great photo opportunity. Although you can see the ascensions from many places around Albuquerque, there’s really nothing quite like seeing it from Balloon Fiesta Park. The special shapes rodeo is also a must-see. This morning event began in 1989 and it’s now the most popular event at the Fiesta. You’ll see everything from enchanted castles and dragons to bumble bees, cows and even a scuba diver. 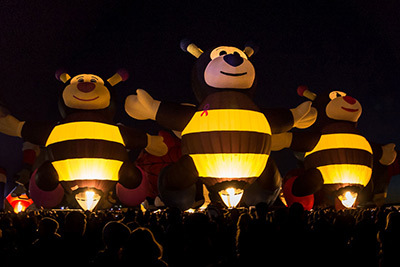 An evening Glowdeo — where the special shapes inflate and glow — has also been added to the schedule. 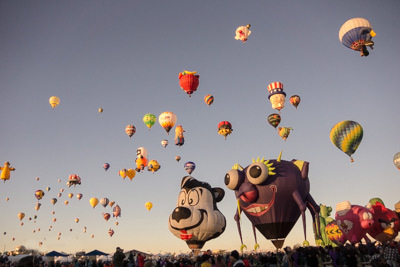 The evening sessions are largely devoted to balloon glows. As with the Glowdeo, the pilots inflate the balloons, but do not launch them. Seeing the balloons glow en mass, is only topped by the spectacular afterglow fireworks show presented at the end of the evening. Lawn chairs are permitted on the field, but make sure and dress warmly, as October evenings in Albuquerque can get a bit chilly. Although there’s certainly adequate access to the Fiesta grounds; if you have problems with crowds, you might want to consider one of the VIP packages. For an extra fee, you’ll be able to sit or stand in a private viewing area, and enjoy a few other extra perks. If you have problems standing for long periods of time, or find it difficult to navigate through crowds, this might be just the ticket for you. The Gondola Club offers access to a special hospitality tent with a private viewing area, bathrooms and a VIP parking area. Additionally, patrons are treated to a breakfast or dinner buffet and an open bar, and they also receive a Gondola Club lapel pin and a special souvenir gift. Shuttle service to and from the parking area and Main Street is also included. All areas of the Gondola Club are barrier-free, and admission is priced at $125 for the first session and $60 for each additional session. And if you’re looking for a bargain, you can enjoy the Gondola Club for $50 on Monday, Tuesday and Wednesday mornings. Alternatively, for just $30 per session you can get access to the Chasers’ Club, which features guaranteed seating in a private patio on the north end of the park. Food and non-alcoholic beverages are included, with alcoholic beverages available for purchase. And like the Gondola Club, it’s completely barrier-free. 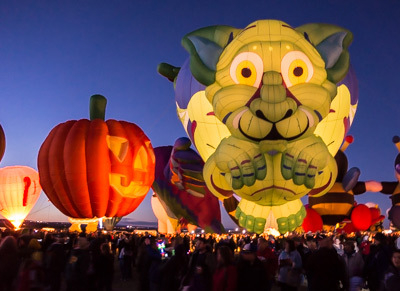 Last, but not least, the Albuquerque Balloon Museum Foundation, offers a fully catered breakfast or dinner and a spectacular view of the Mass Ascension or Balloon Glow from the museum balcony. There is elevator access to the balcony, and accessible indoor restrooms are available to patrons. For more information, visit www.balloonmuseum.com. In the end, no matter what package you pick at the Albuquerque Balloon Fiesta, you’ll be treated to a great show. But make plans early, as some of the more popular packages have been known to sell out.